Across the U.S. cities are looking to green infrastructure to address the threat of increasing precipitation and its associated challenges. This is a prudent investment, as green infrastructure is a resilient and adaptable solution to meeting runoff goals in the face of uncertainty; however, there exists a knowledge gap between engineering designs and validation of performance through long-term monitoring. Without accurate and reliable benchmarking of green infrastructure performance, green infrastructure investments may be misappropriated to under- or over-performing practices. Therefore, in this project we are monitoring the flow rate through two green infrastructure practices in Milwaukee, WI to quantify the variability of volume retention and peak flow mitigation, define the factors that contribute to this variability, and ultimately develop improved metrics for volume retention and peak flow rates in green infrastructure. This project will produce actionable results to guide strategic green infrastructure investments for meeting the MMSD's stormwater goals of zero sewer overflows, zero basement backups, and improved stormwater management. Many metropolitan areas are investing heavily in green infrastructure to mitigate flood risks by managing stormwater where it falls. 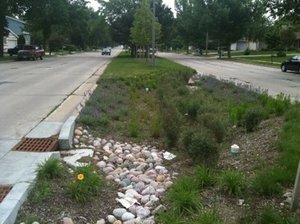 Green infrastructure is an adaptable and resilient approach to managing stormwater; however, current designs are underutilized. Green infrastructure practices contain volumetric storage in pore spaces that could be fully captured if controlled as an active system. Therefore, in this project we are developing a low-cost active control system that can augment green infrastructure practices to improve volume and peak flow mitigation. This active control system will be applied and monitored in a pilot green infrastructure practice to demonstrate performance in the field. In addition, monitoring data will be used to develop models that can be applied within engineering design to accurately attribute volume capture and peak flow mitigation to the proposed active controls. This project will result in engineering, policy, and legal options that stakeholders can use to implement RTC of stormwater infrastructure. Real-time control (RTC) of stormwater basins has been implemented successfully to meet water quantity and quality criteria. However, no existing RTC systems leverage real-time water quality data for outflow control. Previous research has demonstrated the value of simultaneous water quantity and quality control using simulation models. This project extends previous theoretical and modeling work to a real-world pilot demonstration RTC site. Real-time control (RTC) of stormwater basins has been implemented successfully to meet water quantity and quality criteria in the past, but new challenges are emerging. To-date, basin sizing and RTC rule selection methods have failed to incorporate climate variability and internal basin dynamics (i.e, outflow and pollutant removal). This project integrates a novel methodology tntegrate both into a model to size basins and define optimal control rules. Extreme precipitation events in the U.S. cause billions of dollars in infrastructure damages and hundreds of lives to be lost each year. Engineering solutions to these disasters require accurate and reliable streamflow data that capture the magnitude of flood conditions. However, flow rate measurements during floods are inherently uncertain, and physical measurements of velocity during flood conditions are prohibitive in many cases. Therefore, novel methods to measure stream velocity during extreme floods must be considered. This project addresses this challenge through the development of the Aerial Imaging River System (AIRS), a novel system that utilizes drones, video imaging, and object-tracking algorithms to measure velocity in streams during extreme floods. If realized, this system could represent a breakthrough technology that transforms the way that extreme floods are measured. Temperature represents one of the largest impairments for rivers and streams across the United States, and is projected to get worse as land development and climate change accelerate thermal stress on aquatic environments. Solutions will require accurate and reliable models that represent rainfall-runoff temperature dynamics – particularly the characterization of terrain or land surface temperatures. However, existing empirical terrain temperature models are limited by the point-based data they are built upon, and limited studies have considered the high-resolution spatial distribution of temperature across homogenous land surfaces, which are known to be significant. This project therefore seeks to fill this knowledge gap by using a drone to collect high-resolution thermal orthoimagery and applying the data to develop an empirical terrain temperature model. This represents the first phase in development of the Heat Orthoimagery Terrain Temperature Water (HOTT Water) model, a novel comprehensive watershed temperature tool. Experimental sites include Marquette University and the University of Texas El Paso, providing two distinct geomorphologic and climatic regions for model development.